We are now into the final week of the dig and it seems as if the time has flown by. We are narrowing down our operations as much as possible now in order to be sure that we get completely finished on time. Although we have five days this week, we have to allocate at least two of these days for backfilling the trenches we opened. On a commercial site, it is rarely required that trenches be backfilled after the dig is over because the developer moves in with machinery and usually levels the site to their own specifications. We are working on agricultural land which must be reinstated. 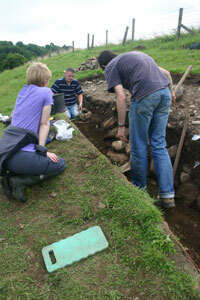 The main jobs to be done are to finish excavating the remaining layers in each of the trenches. We won’t necessarily be taking every layer out completely but we need to get enough out in order to be able to understand what is going on. Coupled with this final digging, we will be taking a series of soil samples which will be retained and processed at a later date for examination by specialists. 10 litre samples will be taken from each layer which will later be processed by flotation to separate out some of the lighter constituents like plant macrofossils (i.e., visible to the naked eye) which are primarily seeds and charcoal. Sieving will help identify heavier constituents that are also of interest like insect remains. Seeds can tell us something about the economy of the site (i.e., what they were growing and eating) and the charcoal, if it is present in sufficient quantities, can be used for radiocarbon dating. A separate set of samples will be for pollen analysis – it is possible that pollen from the various species of plants that were growing in and around the site in the past are preserved in the deposits we are digging. These can give us some insight into what the place was like in the past in terms of vegetation and climate. A third set of samples will be for molluscs (snails) which are very sensitive indicators of specific climatic/environmental conditions. We have been encountering snail shells throughout the excavation so it is likely that these samples will be rich and will hopefully provide good information. The other major job to be completed is to ensure that plans and section drawings of the trenches are completed as a record of the exact location and thickness of each of the layers encountered on the site. This is slow work that only one person at a time can do and often has a knock-on effect on where other people can and can’t work on a site at a particular time. All the the written descriptions of each of the layers and features encountered on the site must be completed and checked and cross referenced with each other as well. There’s a lot of paperwork to be kept up during an excavation. We were joined by a new crop of reinforcements today, Jessica, who is no stranger to Brú na Bóinne, Kim, Louise and Carol. They will be helping in the final push to get and the samples taken and the final recording done and they are very welcome to the site. 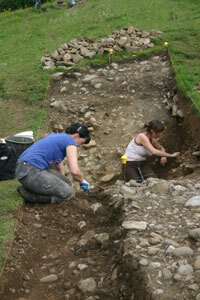 Some additional work was done in Trench 4 today establishing the line of the ditch cut below the waterline. The water is difficult to work around and although Kieran established the position of the cut in two places, we will not be able to establish the full depth of the ditch by the end of the dig. We did our best under the circumstances and the indications are that we are very close to the base. 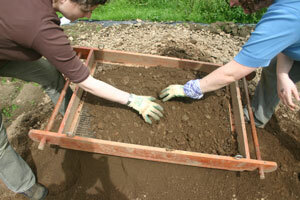 The bottom layers are very hard and gravelly and would be very difficult to get good soil samples from anyway. 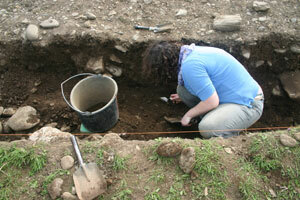 In Trench 1, Kim, Louise, Kieran and Niamh have almost completely opened up the ditch and it is an impressive sight. The depth on the ditch combined with the height of the surviving bank, which would have been higher originally, makes a formidable barrier and sends out a strong statement about the importance and status of the enclosure. Kieran and Louise are currently completing the profile along the southern side of the trench in preparation for drawing the section. In Trench 3 Matt and Darren were joined by Jessica and Carol and they began to take out the cobbles making up the core of the bank. This feature turned out to be very well-built with smaller stones packed in firmly between the larger cobbles. They are close to or on undisturbed natural below this feature which is good – there isn’t a lot more digging to be done in this trench. The final jobs here will be the drawing of the sections – the vertical face of the slice through the layers. In other news today, we were visited by our animal bone specialist Fiona. She was impressed with the amount of bone from the site so far and gave some indications about the best way to clean and store the material after the excavation is over. She had a quick look at a selection of the bones and was able to confirm that there were cattle, sheep and pig bones present as well as fish and bird. It looks like the residents of the Rossnaree Enclosure had quite a varied diet and ate well. A number of the bones Fiona had cut marks on them indicating butchery. Later when the full bone assemblage is handed over for specialist analysis, Fiona will be closely identifying the full range of species represented as well as the number of individual animals so we will get a picture of the food consumed on the site. This entry was posted on July 26, 2010 by Conor Brady. It was filed under Archaeology, Brú na Bóinne, Excavation, ireland, neolithic, River Boyne and was tagged with Archaeology, Brú na Bóinne, Excavation, Rossnaree archaeological dig.